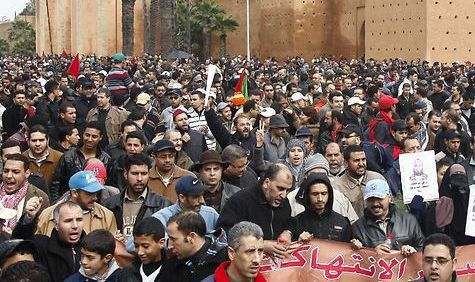 A protester injured in Morocco’s pro-reform demonstrations died in hospital Thursday as a relative claimed he was assaulted by security forces. Kamal Omari was hurt during Sunday’s protest in Safi, 350 kilometres (220 miles) south of Casablanca, where demonstrators also took to the streets. “My brother was marching next to protesters when members of the auxiliary forces isolated him and beat him up,” his brother Abdelilah told AFP. An interior ministry official confirmed that the protester had died and said hospital staff would determine the cause. His brother said he did not think his injuries were too serious at first. “But two days ago, the pain in the head area got much worse and he went to hospital,” Abdelilah said. “He deteriorated rapidly and died today (Thursday) at the start of the afternoon,” he added. Dozens of people were injured in Sunday’s protests, notably in Casablanca where several hundreds of young activists belonging to the February 20 movement gathered.